The Hunter is designed for Wrap-Around labeling on cylindrical bottles and containers. It can be incorporated with a production line or operated individually. When any passing bar code does not match the bar code stored in the memory, the Hunter verification system will stop the machine immediately, show an error message and sound an alarm to alert the operator. When equipped with the automatic rejection system, the noted bottle will be ejected to a side tray as the line continues to operate. When any passing bottle has missing or unclear code, the Hunter verification system will stop the machine immediately, show an error message and sound an alarm to alert the operator. When equipped with the automatic rejection system, the noted bottle will be ejected to a side tray as the line continues to operate. When any passing bottle without a label, the Hunter verification system will stop the machine immediately, show an error message and sound an alarm to alert the operator. When equipped with the automatic rejection system, the noted bottle will be ejected to a side tray as the line continues to operate. An Automatic rejection system is available for removing bottles with any of the above errors from your production line. 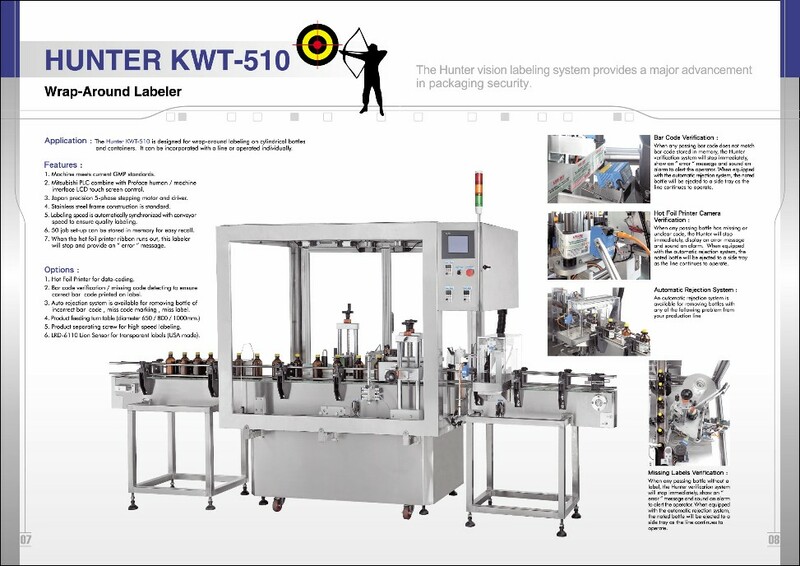 Please contact us for furhter information on the Hunter Vison Labelling System that provides a major advancement in secure labelling system for your products today.